Well I’ve been getting very behind with the blog updates, testament to how busy I’ve been! This set brings it bang up to date. I’ve no idea what’s on the schedule for food tomorrow, so this may well be the last update! I had a very chilled last day in LA – a late start saw us getting to Malibu for around 11:30am, so a late brunch/early lunch was in order. Situated across the PCH from Malibu beach, The Real Inn is a huge surfer hit. Full of boards, plastic fish and laid back vibe. The concept is deceptively simple – a chiller cabinet full of fresh fish, pick your variety, have it grilled/sautéed/cajuned and served with two sides. Magic. The tuna was fantastic and the potatoes delicious. Top value. After a hard day of checking out Santa Monica and Venice, I was in need of a pre-flight top-up. Umami burger is a small chain, with a legion of fans. They specialise in modern burgers, taking the American classic to the next level. Their signature dish is the Umamir burger – a generous beef patty, Parmesan crisp, shiitake mushrooms and a mushroom ketchup – incredible. Umami is a pretty rare flavour and getting a hit of it this strong with the beef is amazing. Pure savoury. The sweet potato chips are pretty awesome too! A rough red-eye flight left me in need of sustenance. Magnolia, like Hummingbird, has become a big deal. They serve a dizzying array of freshly baked delights. I had their cinnamon sugar muffin, which was superb – great way to start the day! 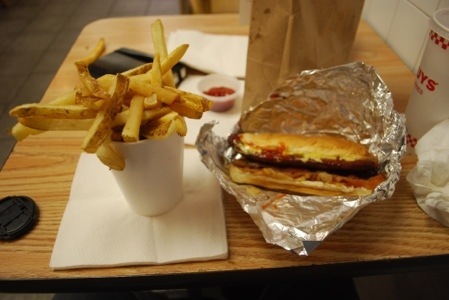 Lunch came courtesy of Five Guys. A small chain that’s really popular in Washington D.C. They serve burgers and hotdogs with a huge array of toppings, all available at no additional cost. Ordering a burger with ‘everything’ would be a mistake. The ‘dog itself was great, split grilled so it’s nice and crispy and served with bacon and cheese. Great stuff. Having sampled the best of San Francisco’s, I owed it to New York to see what they could bring to the table. The best steak in New York is a fiercely debated topic – Luger’s in Brooklyn is widely respected, but it’s a bit of a trek from Manhatten, which left Keen’s. Founded in the 19th century it’s been serving big hunks of meat for years. The interior is akin to a country club – comfy leather armchairs and wood panelling – like Harris it totes a live pianist and house aged meat. 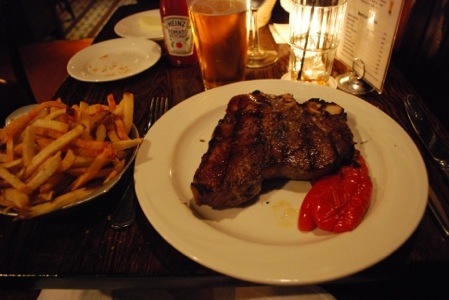 The 26oz t-bone was an imposing sight. Big and very juicy. You could certainly tell it had been dry aged, but it didn’t have the flavour of some British beef, despite being grass fed (finished on corn). The staff were excellent and more than happy to accommodate a lone diner at an odd hour. In a straight fight between Harris and Keen’s, the New Yorker just edges it, but they are very similar! 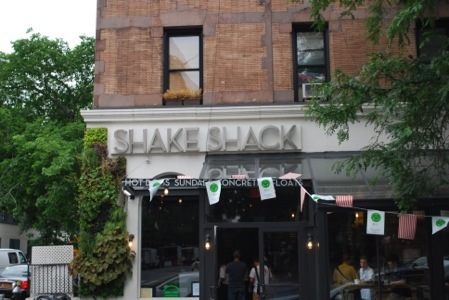 When Heston Blumenthal came to New York in search of the perfect burger, one of the places he stopped was here. Based on a similar vibe to In n Out, they sell simple burgers, with great ingredients, all freshly made. The shack burger was rich and incredibly juicy. The chips were average, but the milkshake was the real show stopper. Made with their own recipe for frozen custard – its wonderfully rich. They also offer ‘concretes’, somewhere at the milkshake end of the sundae spectrum. There’s a couple of branches around Manhatten and the queues can be staggering. Go early. This is a tiny restaurant with a huge reputation. 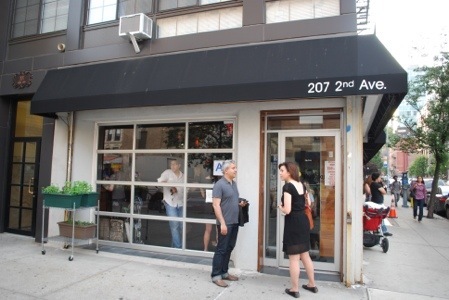 Take a look at the photo below, it’s on the corner of a largely residential area, it seats around forty people, mostly at the bar and dinner for one, including drinks cost under $50. What’s all the fuss about? Just that it’s the 37th best restaurant in the world according to the San Pellegrino rankings (which are a big deal) – it beats out the French Laundry by five places. Yeah. So are the plaudits justified? Absolutely. If you wanted an example of gastronomic value, this would be it! It serves Asian fusion, with a heavy focus on rare breed pork. 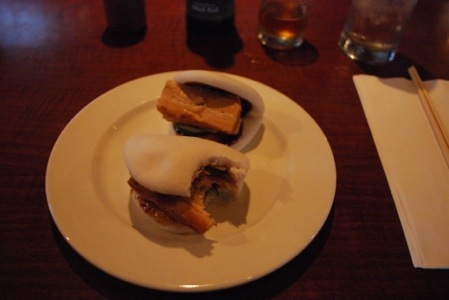 I had the pork buns, the BBQ bun and veal sweetbreads. 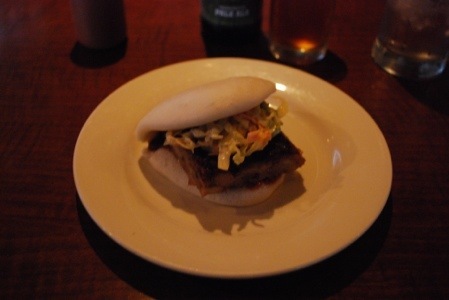 The pork in the buns was amazing, soft, textured, crunchy round the edges and so porky flavoured you expected it to oink. 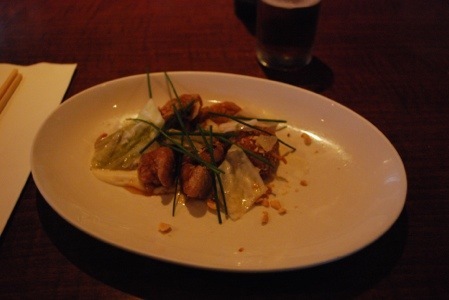 The veal sweetbreads were gorgeous, so nice you overlook the fact that it’s brains. The texture combinations, gentle flavourings and presentation all hit top marks. The staff were attentive and laid back. I loved the fact they offered beer pairings, as well as wine. If you visit one restaurant in New York, make it this one. This entry was posted in food, restaurants, Travel by robmcdonald49. Bookmark the permalink.